If you want to attract people to your Rotary stand at any event, and promote Rotary’s End polio campaign, why not show them an Iron Lung of the sort that was used in the fight against polio. The Rotary Club of Thornbury has purchased an Iron Lung, using a grant from District 1100, which is provided as a mobile exhibit, and which has been displayed at local events. The display is now being offered to all clubs in District 1100 to support their own events, for a small charge. 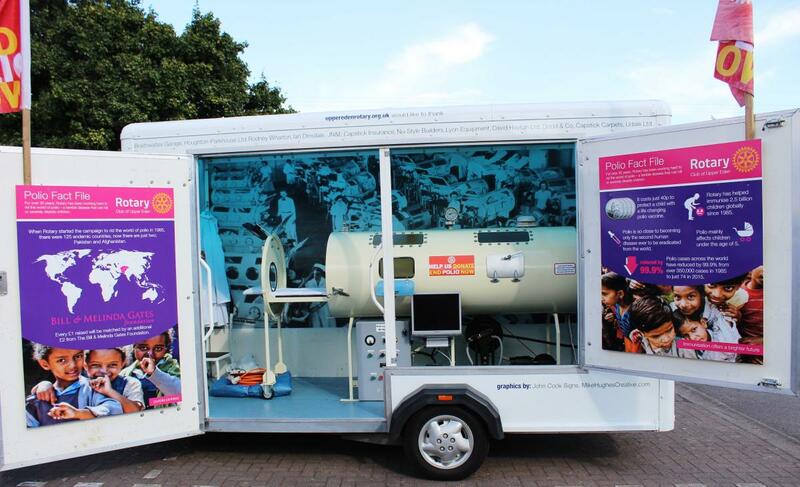 World Polio Day is on 24th October and RC Thornbury is taking bookings for the Iron Lung Display from Clubs, although it has already been booked for 24th! The Iron Lung will be shown in 2019 at the District Conference in Torquay, and it is hoped to show it at The Gables in Falfield before then. For further details of this innovative display contact Ben Bradley on International@thornburyrotary.org . What was the significance of the Iron Lung? Back in the 1940s, 50s and 60s, when polio was at its height, it resulted in the crippling of limbs and muscles, but worse was the attack on internal organs with paralysis. The only way to breathe was in an iron lung which provided negative pressure in a steel drum in which many spent their entire (usually short) lives. Subsequently polio sufferers would have had a hole made in their windpipes, with a tube fixed to a ventilator pump. So the iron lung is a stark reminder of the terrible effects of polio and why it must be eradicated globally. Although recently there have only been a few cases of polio reported annually, the "wild virus" could still pose a threat of polio returning.